The best ecommerce businesses know that the product page is the most important page on their website. That’s why they take the time to perfect it. They try out different layouts, split test product copy, and make sure that everything works flawlessly. Focusing on high-quality product photography, demonstration videos, and social proof, ecommerce businesses achieve extraordinary conversion rates and keep growing their revenue year after year. Today we’re going to look at some of the best examples of high-converting product pages and talk about what makes them so great. The Rocky Mountain Soap Company (RMSC) sells natural skincare products. Their audience is interested in high-quality, all-natural ingredients and RMSC makes sure to accentuate these on their product page by starting their product description with a full list of ingredients contained within the product. 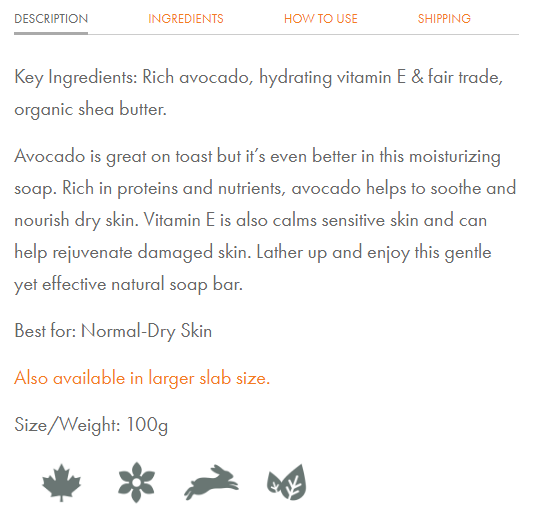 They continue the product description by explaining how each of the ingredients contained in their soap can benefit the customers’ skin. To save on space and make the product description less text-heavy, RSC utilizes icons to show that their product is made in Canada, GMO-free, tested only on people, and completely vegan. Below the product description, RSC showcases other products that might interest visitors. Finally, they display a large number of positive reviews from their satisfied customers. While these reviews are located at the bottom of the page, RSC nods to the overwhelming number of positive reviews by displaying a star rating and review count right below the product title. 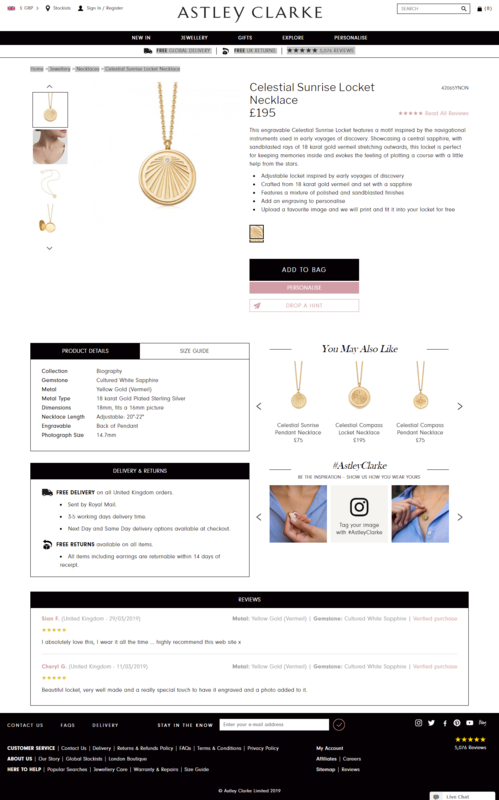 Astley Clarke is a jewelry retailer that takes full advantage of all the space on their product page. Not only do they include a detailed description that outlines all the benefits of their product, but they also display full product details and several additional product recommendations. 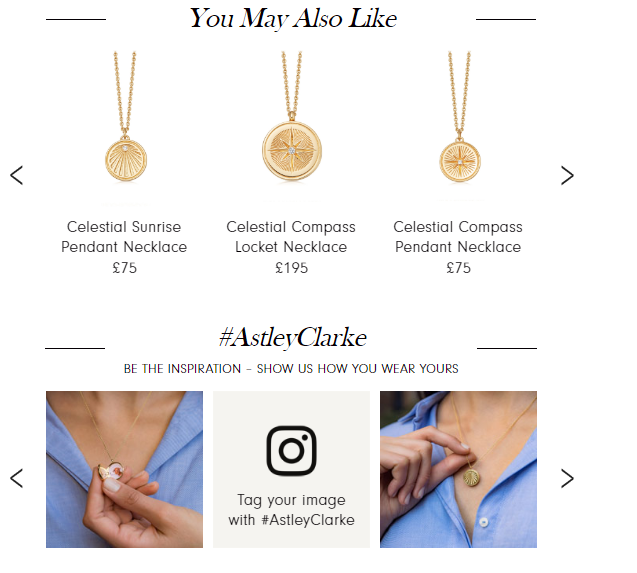 Under the main menu, Astley Clarke showcases the three main benefits of shopping in their online store, which include free shipping, returns, and over 5,000 positive reviews. They also let their visitors know all the details about the company’s delivery and return policies, display a gallery of Instagram images to show customers how they can wear Astley Clarke products, and showcase their reviews. While initially seeming a bit crowded, the Astley Clarke product page contains everything a shopper might want to know about any of their products. Leesa is a mattress retailer that sells its products both online and in stores. Since buying a mattress is a big decision, shoppers will usually be comparing different mattresses and retailers, looking to find the perfect mattress. The people at Leesa know this and have put a great deal of effort into their product pages to make it easier for shoppers to make a decision. They include plenty of high-quality images of the mattress, showing it against a white backdrop and as part of an actual room. Some of the photos also show people using the mattress to help shoppers imagine themselves using the product. Leesa makes sure to use social proof to help convert their visitors. They proudly display their mentions in Mattress Advisor, Apartment Therapy, and Wirecutter. They also make sure to let visitors know about their “100-night risk-free trial” and free shipping and returns offers. 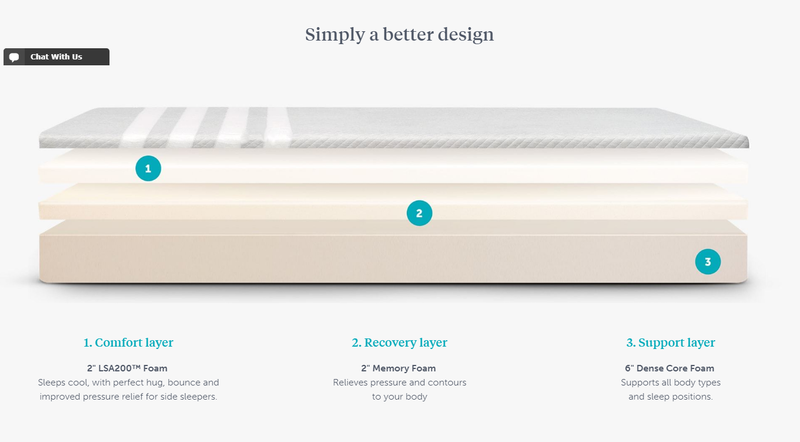 Leesa claims that their product has a better design than other mattresses out there, and they back this up with a visual representation of the three layers that make their mattress, helping shoppers understand why the Leesa mattress is superior to other mattresses. At the bottom of the page, they display their most popular reviews and let shoppers know that by purchasing a Leesa mattress, they also participate in Leesa’s mattress donation program. Finally, the bottom of Leesa’s product page contains a FAQ section where visitors can read answers to some of the most commonly asked questions about Leesa’s mattresses, as well as information on where shoppers can try out a Leesa mattress in person. Ugmonk stocks a wide variety of products including clothing, everyday carry, and prints. They use excellent close-up shots to show all the tiny details on their products and help customers feel as if they’re actually there, holding the products in their hands. 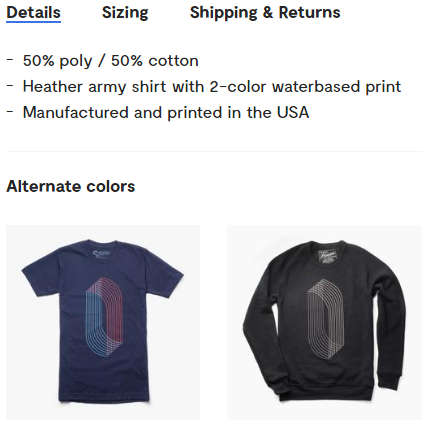 They use tabs to reduce the amount of space that their product description takes up, putting product details, sizing, and shipping details into their own separate tabs. They link to different variations of the product so that visitors can have an easier time picking the product they like the best. Going to the bottom of the product page, visitors can read all the positive reviews Ugmonk products have received as well as browse related products which are shown in large, high-quality photos. Love Hair is a brand that focuses on selling natural hair care products such as shampoos, conditioners, and hair oils. The description for their Revitalizing Shampoo describes the common problem of hair product and hair oil build-up and then goes on to explain how their product can fix this, painting a picture of how the customer’s hair will look, smell, and feel after using the Revitalizing Shampoo. Love Hair uses bullet points to neatly state their product’s features and benefits, making it very easy for visitors to scan the page and quickly figure out everything they need to know about the product. They also include a video that shows a model using their shampoo, giving shoppers a hint of how their hair might look like after using Love Hair’s product. 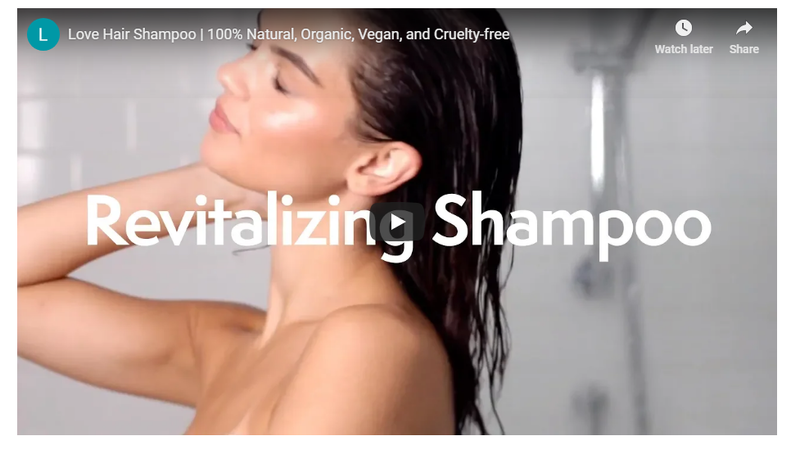 Beneath the video, Love Hair goes on to list all the ingredients used in their shampoo, making sure to let customers know the specific ways their hair can benefit from each ingredient. To create an emotional connection with their customers, Love Hair shares the story behind why they created their shampoo. 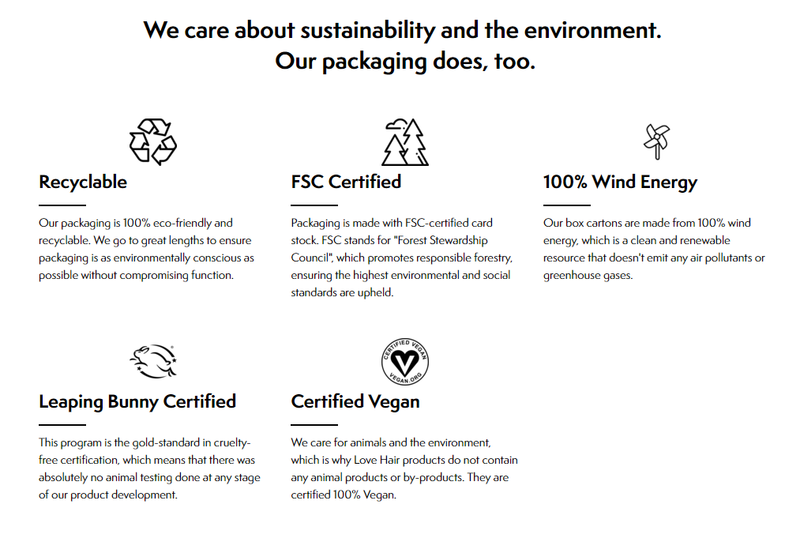 Love Hair also lets customers know how much they care about sustainability and the environment, enabling shoppers to understand that they’ll be helping to save the environment by purchasing Love Hair products. At the bottom of the page, Love Hair displays answers to some of the most frequently asked questions about their products as well as a great-looking collection of photos from their official Instagram account. ModCloth is an online retailer of women’s clothing that uses a large number of high-quality product photos on their product pages, featuring the main product as well as additional, recommended products. The company encourages its customers to leave photo reviews, which results in each page being filled with photos of real customers wearing ModCloth’s products. Apart from showing visitors how ModCloth’s clothing might look on them, it also serves to remind shoppers of the large number of ModCloth’s satisfied customers. While leaving a review, customers are also asked to include their height and other measurements, and state how the product fit them. This allows other shoppers to make a better decision regarding which size they need to choose for themselves. 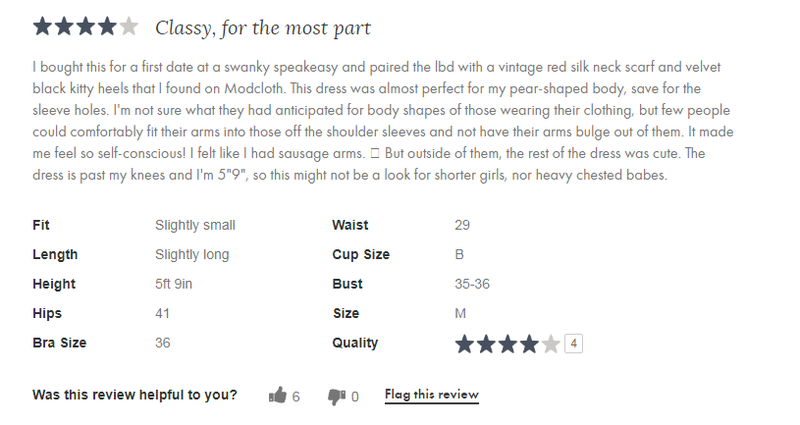 The large number of product photos and the overwhelming number of customer reviews and feedback make ModCloth one of the best places to shop for clothing online. We’ve looked at some of the best ecommerce product pages from around the web. Now let’s put together all the elements you need to create a high-converting product page. You should aim to craft a product title that will allow both shoppers and search engines to quickly understand what you’re actually selling. You can take different angles when naming your product. You could use a catchy title that will delight and entertain shoppers, or make them laugh. On the other hand, you could also create a sophisticated title that will add to the perceived value of your product. The product description is your chance to persuade and convert shoppers with words. To do so, you should focus on the value and benefits that your product can provide to customers. In your product description, write about how the product can improve the customers’ lives. When it comes to taking product photos, you should focus on creating clean images of products on a white background. Using a white background will make it easier for you to edit the photos later and fix any imperfections. You should also try to include a few photos showing the product in actual use. Lifestyle images that show the product being used will enable customers to imagine themselves owning and using your product, making it much more likely that they’ll decide to purchase it. Product reviews help build trust and are an easy way to improve the conversion rate of your product pages. Work on getting more reviews for your product by implementing automatic email review requests and providing incentives such as discounts or free products to customers who leave reviews. Product recommendations are an excellent way to upsell or cross-sell customers while they’re still on the product page. They allow you to increase your average order value and reduce your website’s overall bounce rate. Place product recommendations at the bottom of your product page as to not distract shoppers from the main product on the page. Looking for Help With Your Ecommerce Website? We specialize in providing ad-hoc marketing services to ecommerce businesses. Our ecommerce experts can look at your website and help improve your website and product copy, create high-quality lifestyle images for your brand, design high-converting advertising campaigns, and more.